I: Sefer Simhat tzadik, commentary on the Old Testament by Tzadik Cohen Belinfante (1675-1750), grandfather of the copyist, with some additionsby the copyist on f. 125. II: Sefer Me’ir Hayim, commentary on the Old Testament by Meir Hayi Coh Belinfante (b. Belgrad 1653, d. Amsterdam, 1721) greatgrandfather of the copyist. On f. 17r-18v some additions of the copyist, written in 1750. ספר מאיר חיים / והוא פירוש על איזה פרשיות התורה אשר חבר החכם המרומם החסיד וענו / כהר″ר מאיר חיים הכהן בלינפאנטי מע′ הוא אבי של החכם כהר″ר צדיק של″ט / אבי זקני אשר אני נכדם הצעיר הנושק ידיהם מעתיק דבריהם / החביבים עלי / יותר מהון רב. III: Sefer Nehamot tzadik, talmudic responsa by Tzadik Cohen Belinfante, copied in 1745. ספר נחמות צדיק / על שם הפסוק זה ינחמנו ממעשנו. 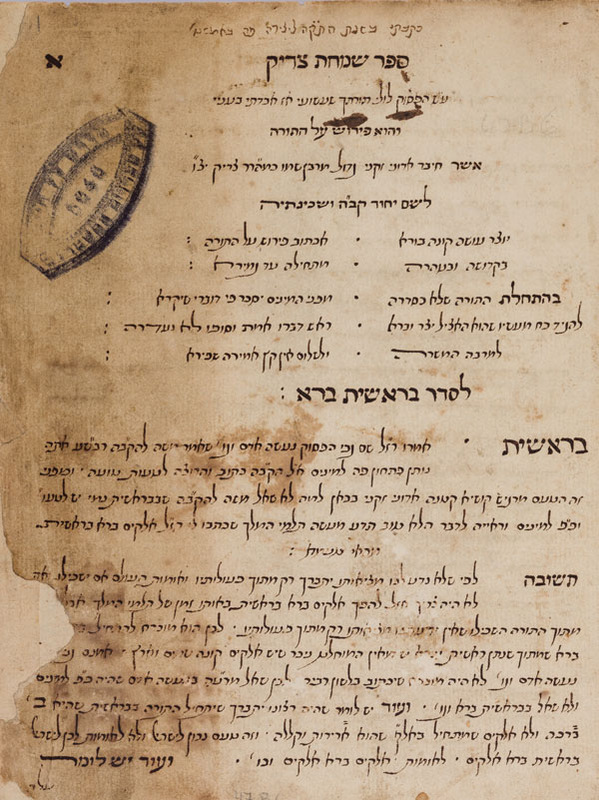 IV: Sefer Pery zadiq, homilies delivered by Zadiq Cohen Belinfante for the pious societies Yadrekh anavim, Honen dalim, Tzidkat nashim, Tiferet banim in Amsterdam, 1709-1738 and for the pious societies Liviyat hen and Ba’ale teshuvah in London, 1745. סר פרי צדיק / דרשיות שדרשתי לשם יחוד קב″ה ושכינתיה פה ק″ק ספרדים / ה′ ישמרם אשר באמשטירדם המהוללה תוך אמוני עם סגולה / בישיבה קדישא הנקרא ידרך ענוים. V: Sefer Haye tzadik, second part to Sefer Peri tzadik, obituaries delivered by Tzadik Cohen Belinfante between 1701-1747. ספר חיי צדיק / ע″ש הצדיקים קרויים חיים / והם דרשיות יקרים לכבוד פטירת צדיקים ואנשים נאמנים אשר נשמותיהם / הקדושים גנוזים תחת כסא הכבוד של מלך הכבוד האל הרחמן והחנון / ודרשתי בישיבות הקדושות פה ק″ק אמשטרדם / והוא עמוד שני לספר פרי צדיק. f. 1r-4v: Obituary for the author’s father Meir Hayim Cohen Belinfante. f. 5r-6v: Obituary for Solomon de Oliveira, 1708.
f. 7r-10v: Obituary for Joseph Senior, chairman of the pious society Honen dalim, 1715.
f. 11r-13v: Obituary for Isaac Abarbanel Arides, member of the pious society Yadrekh anavim. f. 13v-16v: Obituary for David Raphael de Meza, member of the pious society Yadrekh anavim, 1716.
f. 16v-20r: Obituary for David ben Joseph Belmonte, member of the same society, 1717.
f. 20v-24r: Obituary for Moses Hezeqiah Mocata, 1718.
f. 24r-26v: Obituary for the author’s mother Reina Belinfante, 1725.
f. 26v-28r: Obituary for Daniel da Fonseca, 1721.
f. 28r-31r: Obituary for Daid Hezeqiah Suasso Brito, 1719.
f. 31r-34v: Obituary for Aaron Fernandes Nunes, 1726.
f. 34v-37r: Obituary for the author’s father-in-law Eliah Hacohen, alias Persiano, 1720.
f. 37v-41v: Obituary for Raphael ben David Curiel, 1723.
f. 42r-44v: Obituary for Isaac de Crasto de Paz and Moses Josuah Fermy, preceptors of the pious society Yadrekh anavim, 1726.
f. 45r–47r: Obituary for Abraham ben Isaac Zuzarte, 1733.
f. 47v-48v: Obituaryfor Hayim Fernandes, 1734.
f. 48v-50r: Obituary for Eliah Hezeqiah di Mattos, 1736.
f. 51r-54r: Obituaryfor Perla Ahuvi, 1743.
f. 54v-57v: Obituary for Isaac da Costa Athias and Samuel Ahuvi, members of the pious society Yadrekh anavim, 1733.
f. 58r-59r: Obituary for David Gutieres, 1736.
f. 59v-61r: Obituary for Solomon Lopes Colaço, 1738.
f. 61r-63r: Obituary for Benjamin Nunes Enriquez, 1731.
f. 63v-65r: Obituary for Josuah Jessurun Rodriguez, 1723.
f. 66v-68r: Obituary for Rebeccah Nunes Carvalho, 1732.
f. 68v-70r: Obituary for Esther (unreadable), 1733.
f. 70r-72r: Obituary for Isaac Raphael ben Abraham de Meza, 1733.
f. 72r-74v: Obituary for David Salom Moreno, member of Yadrekh anavim, 1741.
f. 74v-75v: Obituary for Joseph de Campos Pereira, 1741.
f. 75v-77r: Obituary for David ben Abraham Zuzarte, 1742.
f. 77r-79r: Obituary for Jacob Nunes Mendes. f. 79r-80v: Obituary for Abigael Roccamora. f. 80v-86v: Obituary for Sarah Hannah, wife of Abraham Zuzarte. f. 86v-89r: Obituary for David Pereira Brandon. f. 87v-89r: Obituary for David Zuzarte. f. 89v-95v: Zikhron teru’ah, obituary for the father of the author, translation from Spanish into Hebrew by Isaac Cohen Belinfante, with short history of the family Cohen Belinfante. For the copyist cf. EH 47 D 32 06.